and very stupid say this. a joy to lick off the lips. who said anything about God. from an old wooden trunk. bark, the girth of age. on the price tag anyway. Prune it, suggests a colleague. I dream of the kiss. A rest and a wakening. See? Do you taste it, she asks. Sabrina Vourvoulias was born in Bangkok, Thailand—the daughter of a Guatemalan-Mexican artist and an American businessman—but grew up in Guatemala. She moved to the United States when she was 15 and studied fiction at Sarah Lawrence College (in Bronxville, N.Y.) with Allan Gurganus, and poetry with Jane Shore and John Skoyles. Her poems have been published in Graham House Review (11 and 13) and in the We’Moon calendar. Most of her publication credits and writing awards have been for her work as staff writer and editor of small local newspapers in New York State and Pennsylvania. She lives in Glenmoore, Pa. with her husband and daughter. 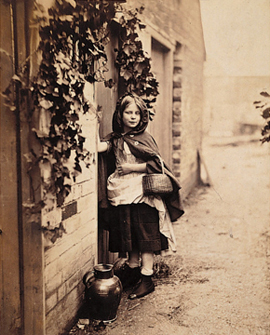 IMAGE: Little Red Riding Hood Arrives at the Door of Her Grandmother’s House, Albumen print, Henry Peach Robinson, 1858.